Randy Haykin, a long time friend and colleague, has a full life – he sings in an chorus, has led a successful venture capital firm, teaches at Berkeley, has a beautiful family, was the founding head of sales and marketing at Yahoo!, sits on the board of several companies, and I could go on… Inspired by a deep sense of Gratitude, he and his partners Chris Pitt and Guru Singh founded The Gratitude Network with the mission of funding and supporting social ventures with the greatest promise to create positive social change. And I’ve recently had the pleasure of working with them toward that goal. The Gratitude Network’s face to the world has primarily been their annual Intersection Event which promises to bring some of the most influential thought leaders from different disciplines together for a day focused on innovation and social change. One of the most memorable moments from last year’s Intersection, held at Pixar, was a compelling pitch from Guru Singh that the needs in the world are massive, unacceptable, and urgent but that the will exists among us to change that and the resources at our disposal (including creativity and brainpower) are infinite. The key, he said, is to bring bright, caring people with dramatically different backgrounds together to uncover innovations with the power to truly move the needle. The Intersection delivered on this promise yet again this year at Google. Where else could you spend the day with Reid Hoffman, Barry Zito, Sheryl WuDunn (Half The Sky co-author), Bill Draper, Evan Williams, a world-famous 12-year-old painter, Steve Jurvetson, Helene Gayle (CEO of Care), talented musicians and many other business leaders, social change agents, educators, investors, entrepreneurs, students, and philanthropists. My contribution was to create an award that would honor the up-and-coming social ventures with the highest potential to create positive social change through innovation – The Gratitude Awards. This year’s award focused on non-profit or for-profit social ventures in education. Why education? Of the nine non-profit categories Glue supports, Education is one I’m highly passionate about because, in a world where nearly 100 million kids don’t go to school each day, where 1 billion people can’t read or write, where some US high schools only graduate 20% of their students, and where most graduates are unprepared for college or the workforce, I’m immensely grateful for the high quality education that was virtually handed to me. Everyone, regardless of where they fell in the birth lottery, deserves an education and the freedom to pursue opportunity. Advancements in global education mean more American kids prepared to succeed in a competitive world, and more children from far-flung corners of the globe become productive members of society rather than a financial burden. They mean a stronger global economy, lower birth rates, healthier families, future innovations, and more peace. And I strongly believe in the power of entrepreneurship to create solutions that are impactful, innovative, scalable, and self-sustaining. 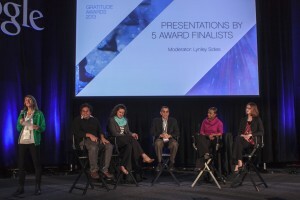 The Gratitude Awards attracted 142 nominees – entrepreneurs from 17 countries whose ventures are focused on improving education through richer content, more effective delivery, greater access through mobile and internet technology, safer transportation, creative funding strategies and more. The ultimate winners, The World We Want, Zaya, and audience pick Kytabu, won cash prizes as well as support and mentorship from The Gratitude Network. And all 10 pitches inspired and made for an audience favorite session. Sheryl Wudunn and her husband Nick Kristoff are making a major difference through their tireless efforts and the influence of their Half the Sky book and documentary. It’s easy to imagine any of the 10 finalists going on to have a broad and deep impact on the world as well. I (and I’m sure the entire audience at The Intersection) wish them all the best in that pursuit.